The boy’s question is d) ironic. The look on his face is sincere, therefore he is not being sarcastic (mean the opposite of what you really want to say especially in order to insult someone, to show irritation, or to be funny) or cynical (believing the worst of people, or distrustful of human sincerity or integrity). His question is not rhetorical because a rhetorical question is a figure of speech in the form of a question that is asked in order to make a point. It is a question asked more to produce an effect than to summon an answer. Irony is defined as a situation in which something which was intended to have a particular result has the opposite or a very different result. 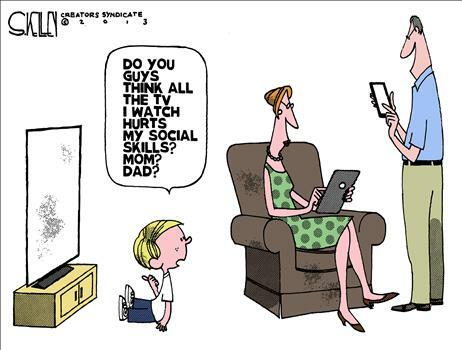 You expect the parents to reply to the boy’s question about whether an electronic device is harming his social skills, but they are so busy with their electronic devices that they don’t even hear what he’s saying.